DO-77964-20 was succesfully added to your cart. Model 77964-20 features a 316 stainless steel housing with an anodized aluminum base. Ideal for pharmaceutical, dairy, biotech, and food and beverage applications. These pump systems give you rugged performance and precise digital control. 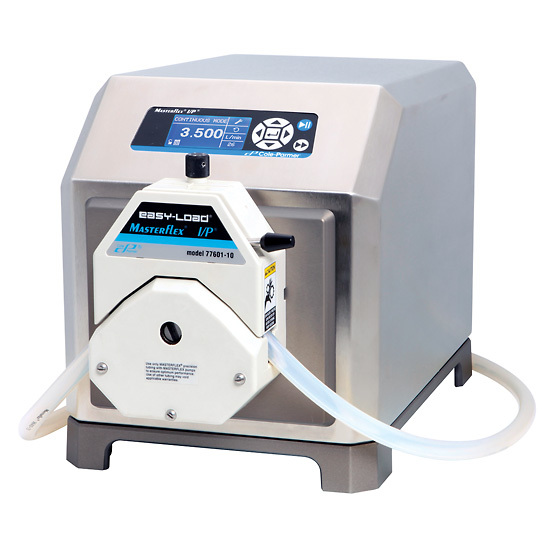 Ideal for fluid transfer, dispensing, and metering applications in laboratory, process, and industrial environments including pharmaceutical, food & beverage, dairy, chemical, manufacturing, and water treatment. The NEMA 4X (IP66) rated housings are completely sealed, easy-to-clean, and resistant to commonly used cleaning and sanitizing solutions. Precision drives feature a programmable dispense interval that lets you set the delay between dispense cycles for convenient, automated dispensing by time or by volume. Programmed calibration ensures dispense and display accuracy—drive stores one calibration value per tubing size. Program the drive via the simple membrane keypad; keypad lock/unlock feature protects settings. Select tubing size and enter desired flow rate—drive locks in required rpm. Can you please tell us which foot switches are compatible with Masterflex I/P pump 77964-20? The Cole-Parmer item number for the foot-switch is 07575-84, Masterflex Wash-Down On/Off Footswitch; 31-Pin Round, 6-ft Cable. What is the maximum flow rated when using Masterflex Platinum Cured Silicone tubing 96410-73 and pumping water. The maximum flow that can be achieved with the size 73 tubing and water under ideal conditions will be 8 LPM. This unit has a 2 year warranty.